The bespectacled woman that opened Demna Gvasalia’s debut collection for the former couture house Balenciaga on Sunday morning was the same model that closed the Vetements show a few nights previous. This wasn’t a happenstance, methinks. Continuity is something that Georgian-born, Margiela and Vuitton-trained Gvasalia gets to play with. 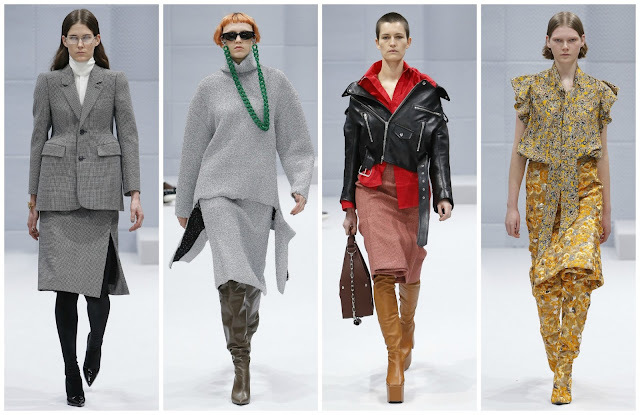 Manipulated shapes, oversized garments and vibrant Vetements florals were all presented at the first Balenciaga show (shown in the former Canal + TV studios, in a white, soundproofed room). The opening look could easily be described as a counterpoint to the Vetements collection; it played with preppy school uniforms—this was the teacher’s uniform. Cocooned hips created “volume that abstracts from the body, a tension between fit and unfit.” I pondered for a while on these looks. I couldn’t decide whether or not I liked them. Powerful or mediocre, it was indecipherable. One dress with exaggerated hips, printed in Prince of Wales check was borderline unflattering. Gvasalia is versed in the subtleties of making the unwearable, unflattering, wearable. I may disagree with his own label’s aesthetic, but this turn at Balenciaga is more interesting than Wang’s was. Founder of the label, Cristobal Balenciaga would probably be unimpressed by the constant renovation of his namesake label. When Nicolas Ghesquière took over as creative director of the brand in 1997, to critical acclaim. He transformed the brand significantly into a valuable, profitable fashion label in the 21st century. He is classed as Balenciaga’s most successful designer to date. The Alexander Wang appointment was proof that Kering wanted to continue hiring “cool” designers to invigorate the house. Mixed reviews, three years, and Wang decided to part ways. Now, Gvasalia arrives—to critical acclaim. Sarah Mower, Tim Blanks, Jo Ellison, Vanessa Friedman all seem to be besotted by his debut offering. Perhaps it was because the collection was referential to the founder, Mr Balenciaga himself. “Cristobal Balenciaga’s methodology was to create clothing engineered to transform how women felt, and how they looked.” This psychological element was mentioned in the show notes (Vetements have a sociologist on payroll). “A couture attitude.” Attitude is very important in the grand scheme of things these days. Vetements—the French word for clothes—sells hoodies and the like, but it also sells an attitude, a lifestyle. Unprogressive casting says a lot about the brand, and it’s carried through to Balenciaga. It’s a shame to see when this brand is considered to be the best new things, subversion and progressiveness at its finest. In reality, it’s not. Secretarial chic, I’ve seen some dub it. Leandra Medine dubbed the opening look, “80s secretary named Mildred who frequently smuggles home tangerines from the office cafeteria.” Thick, knotted chains attached to sunglasses also gave a similar effect. There were blouses and skirts, trenches and puffer jackets. It all looked nice, some were impactful. There were subtle Ghesquière-era influences in the collection—isn’t there always? The success of the "Balenciaga Did It First” Tumblr page, highlighting designers who borrowed ideas from Ghesquière, speaks for itself. Referencing the house’s modern history isn’t all that bad for Gvasalia. Sure, he’ll make a good stab at implementing his imprint on the label, but that doesn’t mean it has to be a Vetements-Balenciaga hybrid . He handled that finely in this collection. Nothing too Vetements-y. I even found myself liking the off-the-shoulder vibe that permeated the collection. Will women be wearing everything off-the-shoulder in the winter months? Time will tell. Time will also tell if Gvasalia’s reign lasts longer than three years, and if he’ll get any better than this. Something tells me he will.